Timberline Wood Stove Package by Colorado Cylinder Stoves is an US-made durable cylinder type steel stove with all the necessary parts plus a stainless steel water tank. Timberline Stove Package by Colorado Cylinder Stoves. Stainless steel water reservoir with a pipe. All parts fit inside for transportation. Check on Amazon they currently have around 15od stores globally and usually offer the best shipping conditions. Note that this is also an Amazon’s Choice product, which means highly rated and well-priced item that is available to ship immediately. Nested 5 – 6 inches stove pipe. This is a cylinder-shaped stove with a flat top for cooking and a welded construction. The legs are 1/2 inch (1.3 cm) in the diameter and removable for transport. They are threaded and therefore they can be tightened or loosened so you can level the stove on an uneven ground. In fact, it is best not to tighten them too much as it might become difficult to unscrew them after all that heating. The stove looks similar to the Camp Chef Alpine stove but here you have no side racks. Instead, you have a large tray on one side which extends the cooktop. On the other side of the stove you attach the water reservoir which is included. They can interchange the places as it suits you. So the stove is for cooking and heating but you can not hang your stuff to dry. But you can always pass a string above the stove and dry your wet clothes. This is a strong construction, a stove built to last. It is built from a 10 gauge (2.59 mm) and 12 gauge (2.06 mm) steel. It is also reinforced with 1 x 1 inch angle iron so it will not warp. The door is also reinforced and the stove’s cylinder body shape is naturally stable against distortion. Such a thick material means more radiant heat as it will hold heat longer, so it is able to heat a larger area than you would expect. It is built compact so that everything fits inside when you transport it. The stove holds heat approximately 4 – 6 hours but the actual burn time depends on the amount and type of fuel. 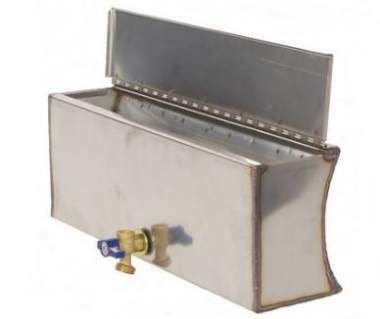 The reservoir is welded and it includes a lead-free brass water faucet so the heated water is potable, and the tank is nicely designed without sharp edges, see the picture. This all is handcrafted in Western Colorado and they claim that the best source material and accessories are used from U.S. manufacturers. The water tank can be attached to any of the two sides. The dimensions are 20 x 7 x 5.5 inches (51 x 18 x 14 cm) and the volume is around 3 gallons (11 liters). This is a 20 gauge (0.81 mm) stainless steel. It comes with a 1/2 in (1.3 cm) brass faucet, brass washer, and a durable Garlock Gasket. The pipe is a nesting type, and this is the easiest to assemble. It starts with 4-7/8 in (12.4 cm) diameter and ends at 5-7/8 in (15 cm) diameter at the top. The bundle contains 5 pieces each 21 inches (52 cm) long. When assembled, it is approximately 8 feet (244 cm) high. The pieces are stitch welded along the seam and they are airtight. To assemble it, all you need to do is to pull the pieces apart and stack. Note that this design is not compatible to use with elbows, this is for the roof jack only and the structure is straight. The nested pipe with 5 segments. Capacity-wise: They write that this stove is able to heat area or tent with the dimensions in the range 15 x 15 ft – 16 x 20 ft (457 x 457 cm – 488 x 610 cm). This would mean 225 ft² – 320 ft² (21 m² – 30 m²). Weight-wise, this is a heavy item so you can use it only at spaces with a car access. The total weight is 92 lb (41.7 kg). Regarding the users, this is an outdoor item and not built for indoor use. So this is a stove for basecamps, for hunters, for camping in cold weather conditions. Total package weight: 92 lb (41.7 kg). Stove only weight: 56 lb (25.4 kg). Stove body size (L x W x H): 26 x 16 x 13 in (66 x 41 x 33 cm). Height with legs: 23.5 in (60 cm). Firebox volume: 2.5 ft³ (71 liters). 4-7/8 inches stove pipe hole. Currently, the only items that are not made in America are the stove pipe damper and the faucet assembly. Here I give this Timberline Wood Stove side by side with two cylinder type stoves from other two top brands, so their basic shape is the same. It is very similar to the Camp Chef Alpine stove but the difference in the weight is due to the water tank and the size. Note also that the other two stoves have side racks which you can use to dry clothes, while in the Timberline stove this is a tray. The differences in the prices are also big, so please follow the links to check for the updates. They write the stove is for seasonal use, one month out of the year, and in such a case it should last 20+ years. You should burn it outside of the tent at least for one hour before using it in a tent. This will cure the paint and its galvanized coating will be removed. Note that you need to wrap the threads of the valve on the water tank with a layer of Teflon tape (not included) before installing the backing nut, this will prevent leaking. Do not use the stove in any permanent structure (home or residence). Avoid using any flammable liquids to start a fire. Use the included spark arrestor to avoid damages on the tent roof. Avoid building an excessive fire to prevent warping the stove. Secure the pipe in windy conditions. Keep the water heater full of water at all times to avoid its warping. Regarding the legs, thread them in only 2 – 3 turns, hand tighten only. Do not use a pipe wrench. Clean the ash after use to avoid drawing in moisture and rust. So as you realize, this Timberline Wood Stove Package indeed includes almost all you need for cooking and tent heating. This is a high-quality stove but my average rating is affected by its weight and price. But if you can afford it, this is a great item, otherwise check the alternatives given in the comparison table above, or search in the category Tent Stoves and Heaters here in the site. If you need a backpack-portable wood burning tent stove, please check the Winnerwell Fastfold Titanium Tent Stove and also this Uncompahgre Collapsible Pack Stove. Check some of the cold weather camping tents where this stove can be used, some of them come with dual pipe jacks on the wall and on the roof. Note that this is not a sponsored text and I am not paid by the manufacturer. I am only expressing my own unbiased views about this product. Please let us know if you have some experience with this stove, there is a comment box below. Use it also if you have any comment or question.